Claire Dodd (December 29, 1911 – November 23, 1973) was an American film actress. Born Dorothy Arlene Dodd on December 29, 1911 in Baxter, Iowa to Walter Willard Dodd, a farmer whose family were early Jasper County pioneers, and his wife, Ethel Viola (née Cool) Dodd, daughter of Baxter Postmaster Peter J. Cool. As Dorothy Dodd, she attended school in Baxter. When her parents later separated in Montana, she went to California, where she worked as a model in Los Angeles and auditioned for minor film roles. While working as a model in Los Angeles, she was cast as a Goldwyn Girl in Eddie Cantor's movie Whoopee!, which was produced by Florenz Ziegfeld. Ziegfeld offered Dodd a part in his next Broadway musical, Smiles. She joined the Ziegfeld Follies and moved to New York City, where she studied singing and dancing. While there, the blond actress was signed to a Paramount contract by Darryl F. Zanuck and returned to Los Angeles. Some confusion has led to Dodd's birthplace being listed as Des Moines, Iowa. Early in her career, Dodd applied for a passport in preparation for a trip to Europe, and was reported as saying she only knew she was born in Iowa. Whether an attempted bit of publicity, she wound up with plenty in her home state. "My early childhood is just a blur to me," she once said. "I don't remember a thing about Iowa, I'm sorry to say. I was so small when I left there." Dodd had numerous relatives who still lived in and around Baxter when her apparent memory lapse was reported in the Register & Tribune's Iowa News Service on April 29, 1935. Locals were in an uproar for a time, spurred on by newspaper editorials taking the incident as an insult to a small town in rural Iowa. Deputy Jasper County Clerk John B. Norris quickly sent a copy of her birth certificate to Dodd by registered mail to end the question. Dodd went on to work at Warner Brothers, Paramount and Universal studios in more than sixty films over a dozen years, from 1930 to 1942. Dodd was usually type-cast as the "other woman," a femme fatale, siren, seductress, mistress, blackmailer, or otherwise scheming blonde. 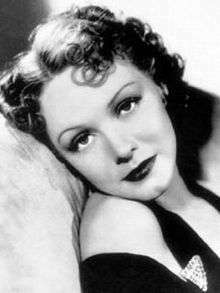 She twice played secretary Della Street to Warren William's Perry Mason, in The Case of the Curious Bride (1935), and The Case of the Velvet Claws (1936). In the latter movie Dodd's character was the only Della to wed Perry Mason. One of her last films was Abbott and Costello's In the Navy (1941). Claire Dodd was Hollywood's "mystery girl" in the 1930s - a label she acquired because she was good at keeping her personal and professional lives separate. In 1931, Dodd married John Milton Strauss, an investment banker. She gave birth to her first child Jon Michael Strauss in 1936, which surprised much of Hollywood society as they didn't even know she was married. The couple divorced in 1938. She retired from acting and married her second husband H. Brand Cooper in 1942. They had four children: a daughter (Austeene); and three sons (John T., Brand, and Peter). She died at her home in Beverly Hills, California from cancer, aged 61. She is buried in the Brand Family Cemetery on the grounds of the Brand Library and Art Center in Glendale, California. ↑ "Jasper Births 1911". IAGenWeb. Retrieved July 3, 2015. ↑ Profile, desmoinesregister.com; accessed July 3, 2015. ↑ Photo of grave marker in the name of Anne Dodd Cooper, ldphotography.net; accessed July 3, 2015. "When Dorothy forgot: 'There's no place like home'", Sunday Times-Republican Past Times, November 17, 1996, Marshalltown, Iowa. Wikimedia Commons has media related to Claire Dodd.